A week ago, I wrote about my problems with the current Broadway revival of a very well-loved musical. If shows like Carousel, My Fair Lady, and Kiss Me Kate want to avoid getting shelved, I argued, then they’ve got to be approached with new points of view, with — to put it bluntly — a basic awareness of the world we’re living in today. As if upon command, Bartlett Sher’s glowing revival of Lerner and Loewe’s My Fair Lady has arrived at Lincoln Center to prove that it can be done. A beloved musical from another era can keep on kicking, and, as is the case here, it can even do so without making radical shifts in aesthetic, as long as it’s got its eyes wide open. Granted, Sher and his company — led by the luminous Lauren Ambrose in an intrepid, intelligently scored performance — have an advantage over their clam-baking colleagues: Their source material is already relatively self-aware. Alan Jay Lerner adapted the book of My Fair Lady from George Bernard Shaw’s Pygmalion, a complex social comedy about class and gender (more deliberately about class) that started giving its author headaches as soon as it hit the London stage. Shaw never intended his protagonists — the undaunted Cockney flower-girl, Eliza Doolittle, and the self-satisfied phonetics professor, Henry Higgins, who teaches her to speak “like a lady” — to end up romantically linked. In a wonderfully on-brand move, he even wrote a grouchy postscript for his play in which he explicitly outlined Eliza’s future and put the kibosh on any hook-up with Higgins: “The rest of the story need not be shown in action,” he sniffed, “and indeed, would hardly need telling if our imaginations were not so enfeebled by their lazy dependence on the ready-makes and reach-me-downs of the ragshop in which Romance keeps its stock of ‘happy endings’ to misfit all stories.” Sick burn, Bernie. My Fair Lady opens with a bustling crowd scene at Covent Garden, but even before that begins, near the end of the overture, as Donald Holder’s jewel-toned lights start to illuminate the depths of the Beaumont’s vast and still empty stage, only one figure walks out into the space. The silhouette of a young woman moves through a swath of blue that feels like a bracing sunrise. Eliza isn’t even carrying her basket of violets yet. She’s not yet a flower girl, not yet a character in My Fair Lady — she’s a person on the edge of something, an actress who’s about to step into a great role, a woman whose story is about to begin. Throughout the production, Sher and Ambrose find key moments to return to this image of Eliza alone, outside the confines of her own play. Michael Yeargan’s exquisite set provides vital assistance here: For many locations — Covent Garden, Ascot, the bars Eliza’s father frequents — standard, elegant place indicators sweep in and out. But for the show’s central setting, Professor Higgins’s well-appointed home, Yeargan has deployed a massive turntable that enters and exits the main playing space and revolves to show us multiple rooms in the house. It’s not a new idea, but I’ve seldom seen a set piece structured so cleverly or used so effectively to score a show’s storytelling. Its layout and speed allow Sher to move characters throughout the house as they sing, timing their entrances into new rooms (or their dramatic exits) with buttons in the music. For Eliza especially, the set provides a crucial sense of motion. She’s come to Higgins’s house of her own accord, after an initial encounter in which he bragged that “in six months [he] could pass her off as a duchess at an Embassy Ball” by transforming her “curbstone English” into “proper” speech. Taking her chance for social advancement into her own hands, Eliza calls the professor’s bluff and becomes his student. Here things can get a bit tricky: As the late David Rakoff described in a brilliant takedown of the musical Rent, it’s difficult to dramatize the creative process, and the same might be said for teaching and learning. We’ve got to spend a believable amount of time listening to Eliza pronounce the letter A as “aye,” but we’ve also got to feel like dramatic progress is being made. Yeargan’s dynamic set, combined with Ambrose’s beautifully calibrated performance, always makes us feel as if events — educational and emotional — are rushing forward. Eliza is growing up, becoming fully herself, and we can both see and feel it happening. That performance starts small, then grows and grows. In Ambrose’s first scene I felt a little thrown by her relative reserve — I still had Audrey Hepburn’s shriller protestations and exclamations stuck in my head. But gradually, I realized how carefully Ambrose has calculated Eliza’s arc. She’s building a real awakening for the character, a full transformation from a girl that — for all her pluck — was raised by a drunken father who’s taken his belt to her, to a woman who means every word of it when she sings to Higgins late in the play that she “can do bloody well” without him, or anyone. Her voice is sheer loveliness from the start, and when she finally lets it really soar at the climax of “I Could Have Danced All Night,” the hair on my arms stood up. And not just because the music is beautiful. With Ambrose singing it, “I Could Have Danced” emerges as a love song that’s not really about love — it’s about the exhilaration of success. Eliza has broken through for the first time in her battle with received pronunciation, and she and Higgins and his colleague Colonel Pickering have just burst into a joyfully uninhibited song and dance of celebration (“The Rain in Spain”). Now, after the men have gone to bed, she wants to keep dancing — but she also wants to keep learning. Ambrose sings much of “I Could Have Danced All Night” with her stack of textbooks in her hands, even creeping back for them after Higgins’s housekeeper Mrs. Pearce turns the lights out on her. The lyric involving Higgins himself — “I only know when he began to dance with me, I could have danced, danced, danced all night” — feels less gushingly romantic than excitedly circumstantial. It’s not really about him (it never is, guys). It’s about her own desire to keep going — to keep feeling, keep reading, keep discovering the world and herself in it. Sher underlines the song as a moment of revelation, rather than infatuation, when, during its final moments, he has Ambrose step off the turntable. She holds her final glorious notes while Higgins’s house pulls away into the darkness behind her: Again, for a moment, she’s both in and outside the play, alone in an empty space and victorious. Higgins can be a bully and a baby, but he’s also articulate, passionate, and (though he can’t admit it to save his life) truly fond of Eliza. Hadden-Paton shows us all of this while delivering the character’s verbose, amusingly backward songs with a perfectly pitched combination of clear, pleasant singing and the talking-on-rhythm that Rex Harrison made unforgettable. It’s both a smart acknowledgment of an indelible performance and a graceful escape from it. In Hadden-Paton’s hands, the character’s comedy — and his tragedy — is that he’s a man who prides himself on self-knowledge yet doesn’t know himself at all. His major songs — “I’m an Ordinary Man,” “A Hymn to Him,” and the wonderful “I’ve Grown Accustomed to Her Face” — are all hilariously pointed studies in vanity: The man doth protest too much. Only “I’ve Grown Accustomed” sees Higgins starting to wake up, and by that point, it’s too late. Hadden-Paton’s Higgins is visibly hurt by what he perceives as Eliza’s abandonment of him, and he’s never learned to process disappointment or, worse, emotional vulnerability. He shows us a man whose own journey of self-discovery is only just beginning well after Eliza has embarked upon hers. When he makes it to that final problematic line (“Where the devil are my slippers?”), he’s overcome by feeling and simultaneously unable to do anything but fall back on his snide flippancy. Hadden-Paton almost whispers the line — he can hear himself making the mistake and he can’t stop himself. I won’t spoil Ambrose’s gorgeous response, but suffice to say the final gesture she and Sher have come up with preserves the play’s rich ambiguity, while also clearly leaving Higgins in the shadows of 1914 while Eliza strides confidently into the 21st century. Beyond My Fair Lady’s newly enthralling central story line, there’s a wealth of delicious detail in this production that ensures the play isn’t smart at the expense of fun. Catherine Zuber’s costumes satisfy all our Downton Abbey–esque desires for tailored Edwardian finery, and her attire for the ensemble during the “Ascot Gavotte” is particularly splendid, an array of wild silhouettes rendered in a sleek, muted palette of silver and lilac. It’s also worth noting that in this scene, Ambrose’s Eliza finds it noticeably difficult to walk in her extravagant dress, high-heeled shoes, and mile-high confection of a hat. Her struggle is both a great comic touch and a sly comment on the ludicrous world she’s entering. The supporting cast are uniformly excellent, with Allan Corduner playing an appealing, excitable Pickering; Jordan Donica’s richly sung Freddy Eynsford-Hill evincing swoons with “On the Street Where You Live” (a love song that, importantly, never gets its singer what he wants); Manu Narayan getting big giggles as Higgins’s smarmy former student, Zoltan Karpathy, in a performance that brings to mind Sweeney Todd’s antic Adolfo Pirelli; and Tony-winner Norbert Leo Butz’s resolutely “undeserving” Alfred P. Doolittle successfully bringing down the house with perhaps the most shamelessly over-the-top “Get Me to the Church on Time” in recent memory. 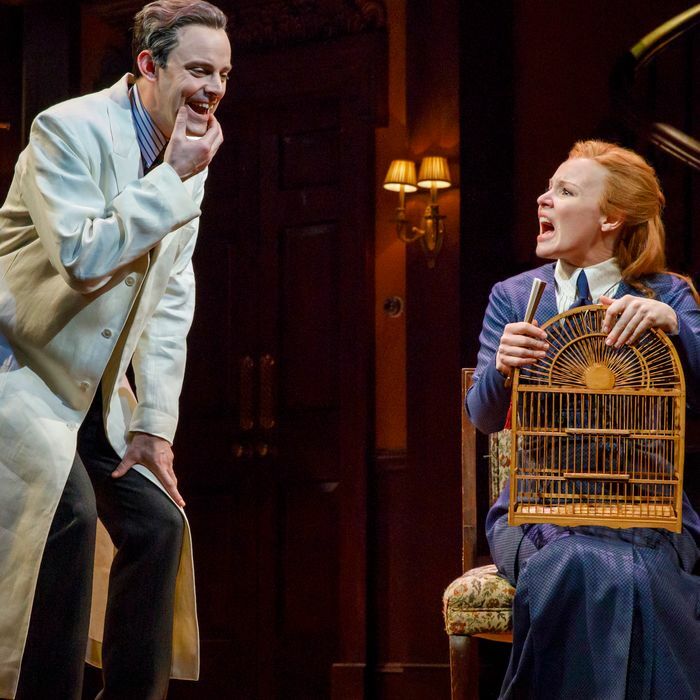 That song’s a riot and, like the production overall, it’s full of smart little gestures from Sher that remind us that the world of My Fair Lady is a rapidly changing one. A cross-dressed bride and groom — the latter a Chaplin-esque tap-dancing drag king — emerge from a music hall to dance with Alfie during his premarital musical throwdown. Earlier, a group of suffragettes march across the stage during a transition, carrying signs demanding votes for women. Sher hasn’t removed My Fair Lady from its world. He and his company have simply approached it with a keen sense for this one. The only issue left is the title — and, in the end, perhaps it’s less problematic than Shaw’s, for Ambrose’s brave Eliza exposes its silly irony: She’s no one’s fair lady, and if anyone still believes her play is about a man “molding” a woman, they haven’t been listening. A man taught a woman some vowel sounds. She did the rest herself. The truth is that a production like this — reenvisioned not so much in aesthetics but, in both subtle and overt ways, in narrative and thematic focus — should be the baseline for big musical revivals. This is where these shows can and must begin. Then, like Eliza, they truly can go far.